Someone send us a View-Finder, please? You’re engaged, you’ve picked your wedding date, and now you’re looking for save the date ideas, so your friends and family can mark their calendars! 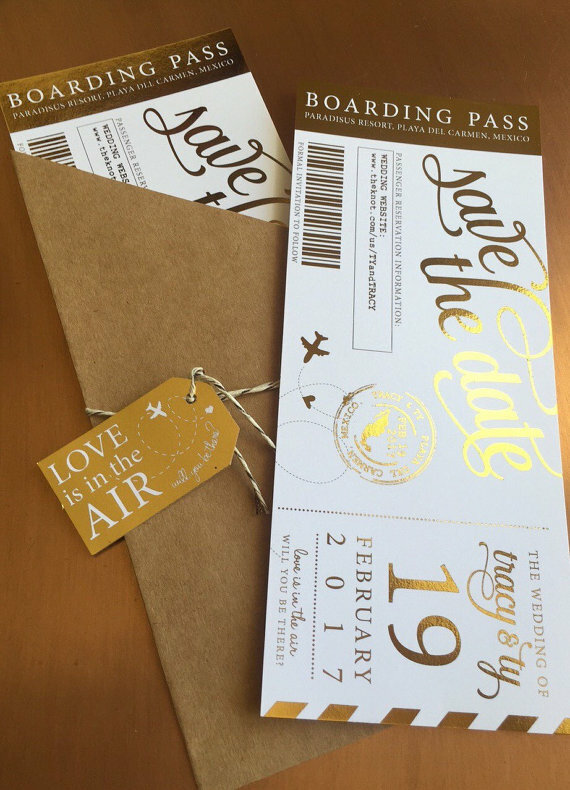 Save the dates are like pre-invitations with logistics like the date and wedding location so that guests know that a) they’re invited, and b) not to make any other plans that day. Save the dates can also be a fun way to show your personality, since they don’t have to match, well, anything. Not the formality of the wedding or your other paper goods or your families’ opinions. The great thing about save the dates is that they’re a recently modern invention, so chances are your grandmother has no opinions on them. 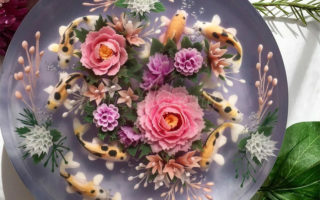 That means that if you’ve been looking for a creative wedding project, this might just be the perfect thing—because maybe you want to send your loved ones something quirky and non-traditional, like balloons or chocolate, with no complaints. So, now that we’ve all admitted that we’re a little bit into over-the-top save the date ideas, and maybe you want to DIY your save the dates. Start by thinking of things you can buy in bulk! Things like playing cards, maps, balloons, and buttons are easy to repurpose or personalize so that you don’t have to break the bank for a cute idea. We’ve split this post into two handy sections: nifty new ideas that you can craft or recreate, and super cool and (mostly) affordable save the dates you can buy. But first, here’s a list of the fifty save the date ideas we’ve dug up (plus plenty of inspiration pictures below). caricature Stamp: Okay, we cheated a little bit with this one. You’ll have to buy the stamp, then you can DIY whatever you want with it! 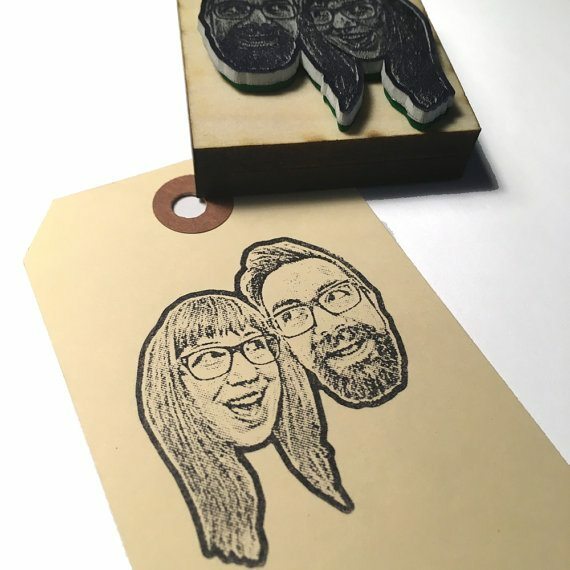 This crazy cute couple caricature stamp is a great way to turn super cheap tags into something fun. Plus you can use it on decor for the wedding. Finger and ransom note: This is hands down the creepiest save the date we’ve ever seen. And unlike the prototype here, we suggest you add your names and the fact that you’re having a wedding, or you might get a few upset phone calls after you send them out. And, honestly, you might still get a few. But these save the dates are a couple with a dark sense of humor’s dream. Photostrip: Keep your photo session simple with DIY photostrips, with or without a magnetic back. You can even make and print them from the comfort of your own home—no photo booth needed. Tea Towel: At first this will make some super special kitchen decor, and then later it will be functional and remind people of that joyful day. mini Easel: Want to keep your save the date minimal (like really really minimal)? Consider creating mini art! Seed packet: You can choose to buy the packets san seeds (so you can select your own) or buy them with seeds already included. Save the date ideas like this are filed under the DIY section, because we think including your favorite flowers seeds inside is a fun and personal detail. That way everyone who gets them can grow a little bit of your love. Or at least your favorite flowers. Secret Message: Test your guests’ spy skills! Your friends and family will have to break out their decoder glasses (included) to find and save your date. Fancy Footwork Card: Let your guests know that they’ll have to break out their best moves for your wedding party. Martha’s got you covered with a DIY; scroll down into the comments on the post for the PDF. 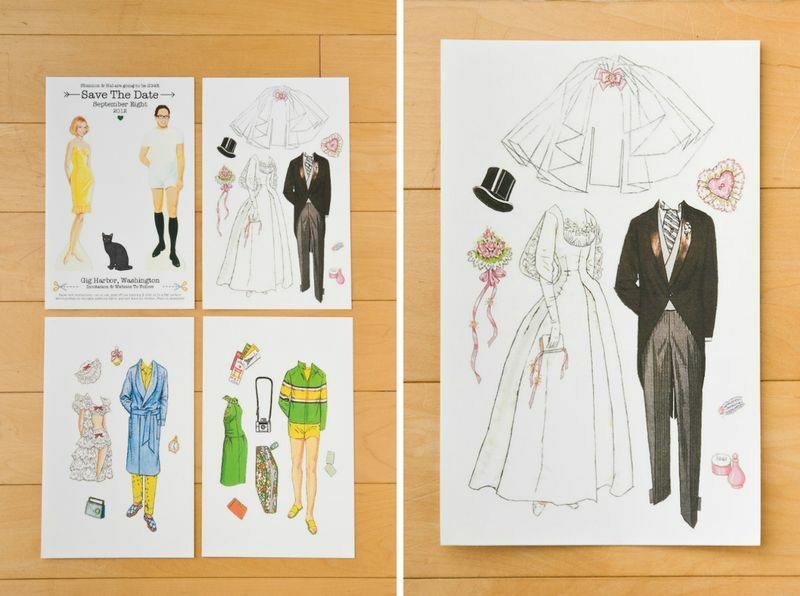 Paper Doll: Channel old-school playtime with DIY vintage paper doll save the dates. This woman worked her photoshop to make the dolls look like her and her fiancé. Word Search: Save the date ideas that are fun can also work hard and accomplish two jobs at once. Guests didn’t know the couple was engaged, so this doubled as an engagement announcement. Hidden within the letters was their surprise message! Scratch-off ticket: Share your luck in love with these DIY scratch-off save the dates. If only all scratch-offs were this easy to make. Knot tie card: Tie the knot, literally. These save the dates are a fun spin on the classic saying and an easy DIY. Harry Potter Platform 9 3/4 Ticket: This is perfect for couples who want to pay tribute to their love of Harry Potter without a ton of DIY. 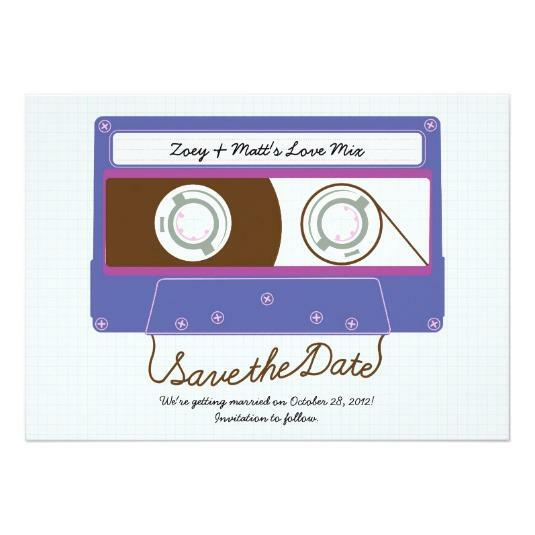 Cassette Tape Stationery: These save the dates are for the chill and retro couple who miss the ’90s but don’t actually want to make a ton of mixtapes. Colorful Letterpress: If you don’t want to stray too far from traditional save the date ideas, but still want something a little special, consider this neon letterpressed stationery. Personalized Pencils: Make it quick and easy for your guests to mark you down on their calendars with these fun personalized pencils. These would be great for a school-themed wedding or a teacher in love! Plus, unlike so many wedding-related things, they’re guaranteed not to go to waste, and you can enjoy the extras for years. Metallic Boarding Pass: We love these gorgeous metallic boarding passes. They get across all the necessary wedding info while letting everyone know you’re having a glam destination! Boozy Lollipops: Send out of these boozy little lollipops as a preview of all the sweet times that’ll be had at your wedding. *The lollies are also available in non-alcoholic flavors if you want to keep the kids happy/avoid any boozy surprises. Customized Balloon: How often do get people get balloons in the mail? Not often enough, in my opinion. Send out these cool save the dates and guest will be doubly excited. hand Painted Lotería: This color palette and groom in a traditional Lucha Libre mask is near the top on the list of super fun save the date ideas. This couple decided to celebrate their culture by creating a colorful custom Lotería game! 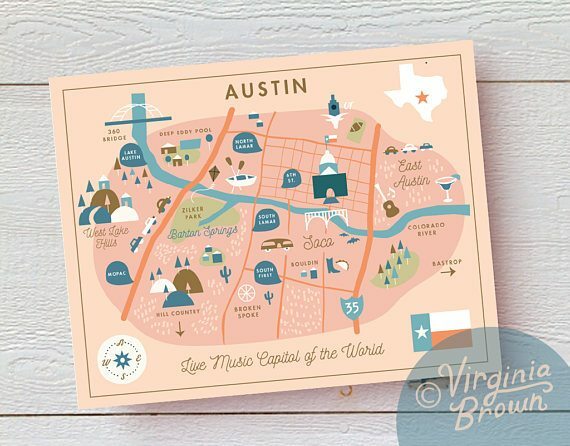 illustrated Map: Out-of-town guests will love this fun and functional save the date. The maps are all customizable and can be made to represent any city you want! Personalized Magnet: Magnet save the dates are popular for a reason, guests will be reminded of your date every time they go for a snack. Even better, Etsy has tons of these so you can have it personalized to even the most niche interests. Crossword Puzzle: Let your friends and family know your wedding date AND give them something to do on a Sunday morning. Felt Flag: Coral Pheasant created these flags for a couple who met and fell in love in college! These save the dates can be customized to your school colors and are sure to get your guests into the wedding spirit! Holographic Heart: If you’re planning a colorful and sparkle-filled wedding, this stationery fits the bill. 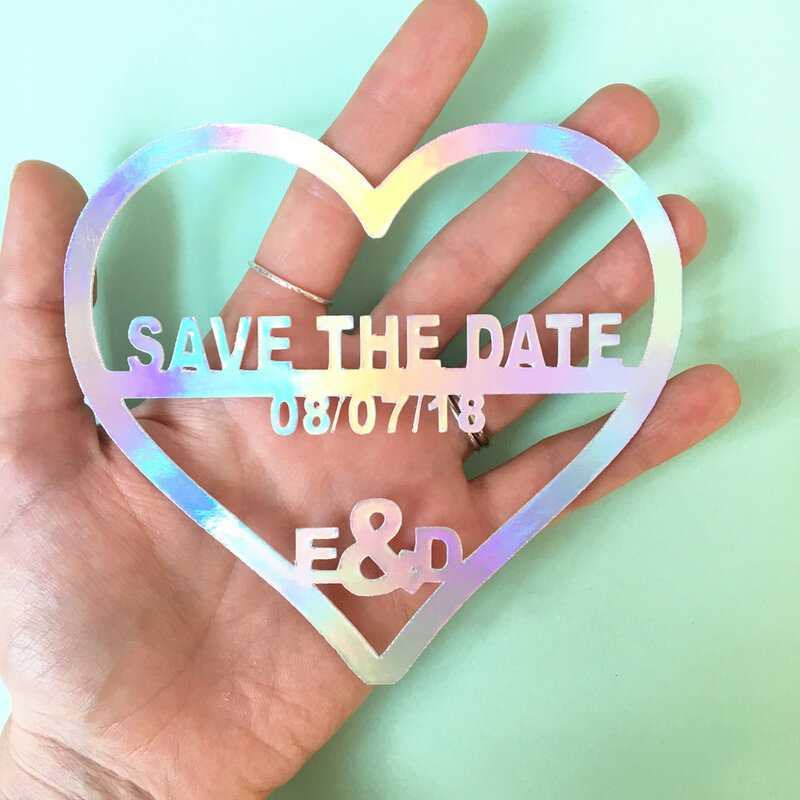 These iridescent save the dates are perfect for the outside-the-box couple! Paper Airplane: This save the date is great for couples planning weddings abroad, you can personalize and print them right at home. No muss, no fuss! 3D Anaglyph: Make your save the dates pop! This couple put a twist on traditional stationery and sent anaglyph save the dates and 3D glasses to all their guests. Ferris wheel: This adorable postcard lets your guests spin for your wedding details. Flowchart: Give your guests no other choice but to attend to your wedding. 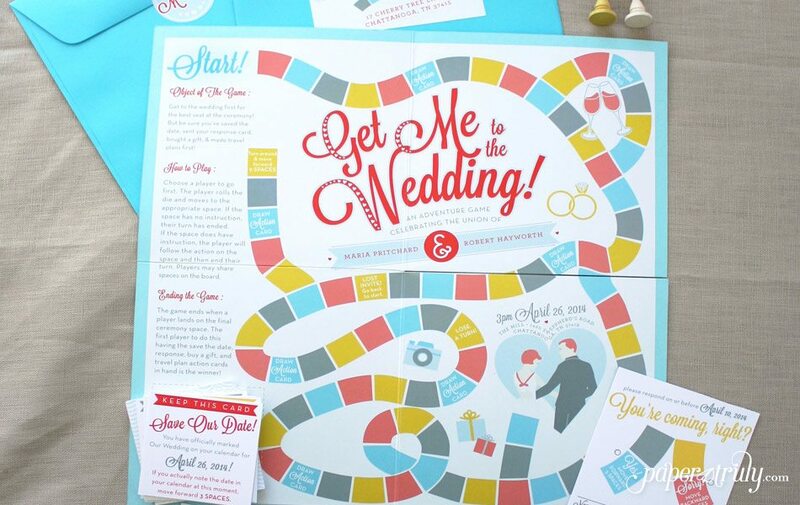 Okay not really, but these fun invitations are great for a couple with a good sense of humor. School note: These printables are simple to create and give me middle school flashbacks in all the best ways! Board Game: Treat your guests to an impromptu board game! Think The Game of Life: Wedding Edition. These save the dates come in both DIY and full assembly options, so you can put in as little or as much effort in as you want! holiday Ornament: Send these out for your Christmas wedding or as a celebration of your favorite season. Or send them out whenever, because these would be a beautiful way to share some cheer, any time of the year! Laser Cut: So dainty, delicate, and beautiful you could (and probably should) frame them. 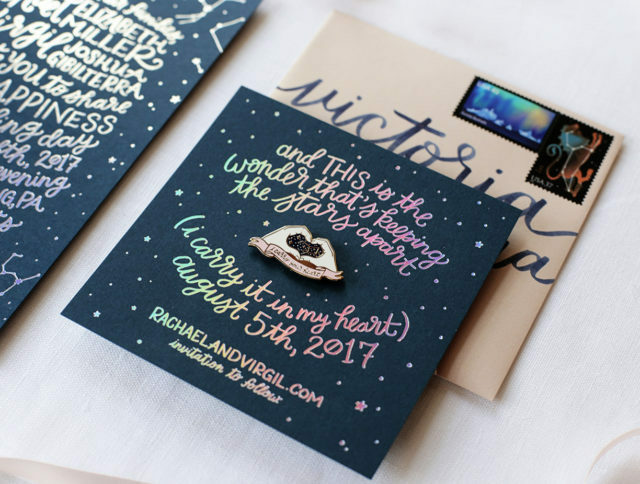 These save the dates are custom beauties that your friends and family will be talking about for a while. 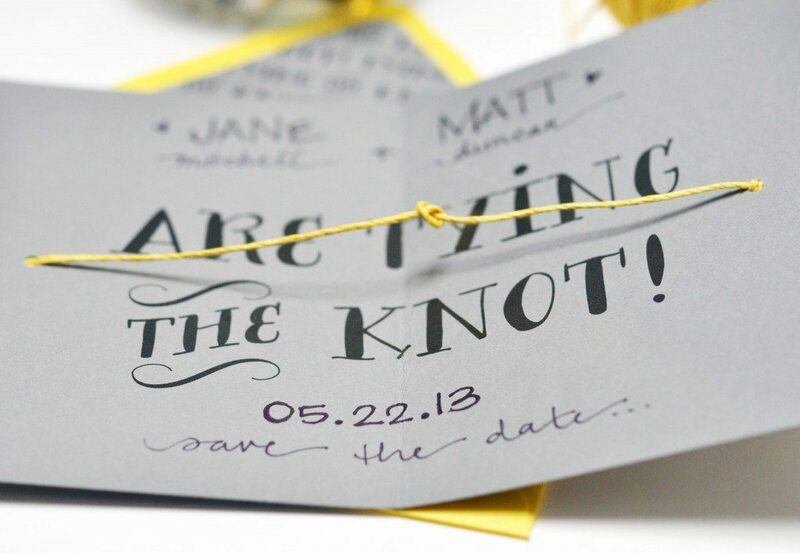 old-school Windows: This save the date idea is funny, geeky, and reminiscent of the ’90s—aka the perfect combination. View-Master: Okay so let’s address the elephant in the room, these are… expensive, especially since the starting price only includes forty View-Masters. But these save the dates are so cool and unique and retro, we couldn’t not mention them. Maybe someday someone will send us one! drink Umbrella: Give a tropical feel with this textured beach chair stationery. Drink umbrellas included! customized Chocolate Bar: Who doesn’t love the day when a candy bar comes in the mail? These custom candy bars are budget friendly and come in Hershey’s Milk Chocolate with Silver or Gold Foil, Hershey’s Special Dark Chocolate, or Belgian Milk Chocolate. 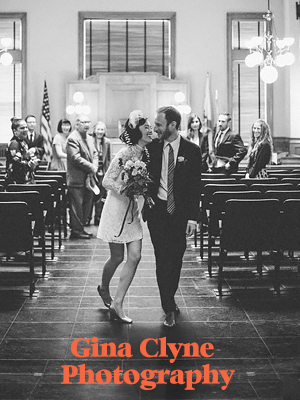 Library book Checkout slip: Tell your love story through the magic of smart and chic literary elements. Floral Wreath: This save the date is a luxe letterpress option that keeps it simple and classic. Minted is one of our favorite sources for save the dates (and all wedding paper goods, really), and their choices are nearly endless. Trifold: You spent precious time (and money) on your engagement pictures, so why not use a many as possible in your save the date? This one gives you a great bang for your buck. Happy Heart: Hearts don’t have to be cheesy. This stationery is sweet without being saccharine and would be perfect to send out for a Valentine’s Day wedding. Let’s I Do THis Thing: Straight and to the point. You’ve got the info, and you’re ready to do this thing. 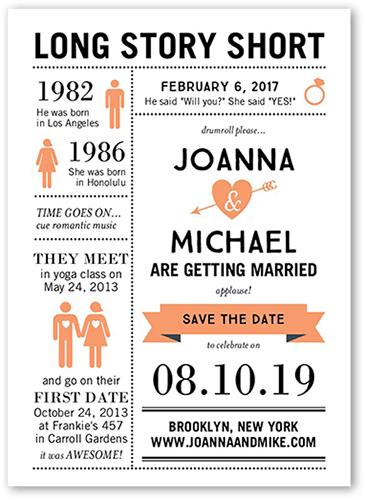 Love Story Infographic: Use your save the date as an opportunity to tell your love story with a fun infographic. Guests that don’t know both partners will love the extra insight. 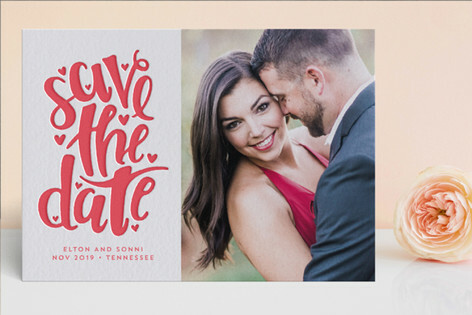 Check out the Shutterfly Wedding Shop for more cute and affordable save the date ideas. Beach Adventure: Let guests know that you’ll be celebrating by the sea at your laid-back wedding. I can hear the waves just looking at this one. Simple Flowers: Give your save the dates the hand-painted feel without the hand-painted price. This is a collaboration with Rifle Paper Co., and we’re way into it. Happy Together: If you’re not into florals and still want a fancy feel, try a save the date that’s centered around calligraphy. Blooming love: This save the date just screams Spring: the flowers are blooming and so is your love. Paper Source also has tons of great save the date ideas, so get shopping. P.S. If you’ve gotten to the end of this post and still haven’t found the save the date idea you’re looking for, check out Oh So Beautiful Paper’s Save The Date Archives, and prepare to lose half the afternoon. 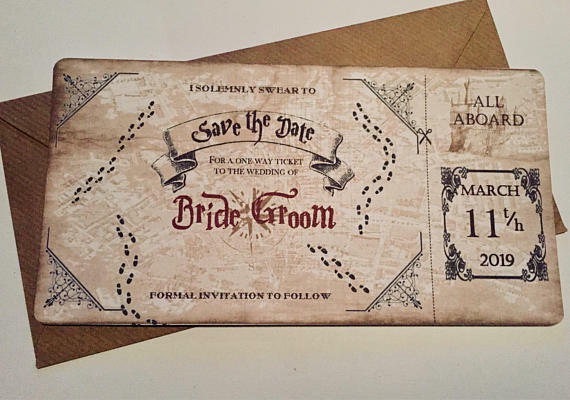 What were (or are) your Save The Dates? Did you buy? or do some DIY?